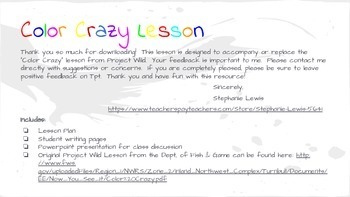 This lesson is designed to accompany or replace the Color Crazy Lesson from the Department of Fish & Game's Project Wild. 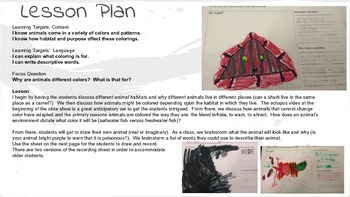 The lesson teaches students about how habitat and purpose affects an animal's coloring. 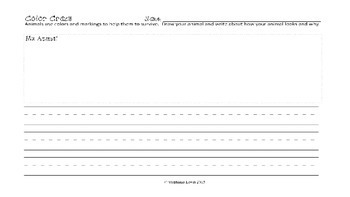 It addresses why animals would be colored as they are depending upon habitat and the primary purposes for coloring: hide/blend in, warn, attract. 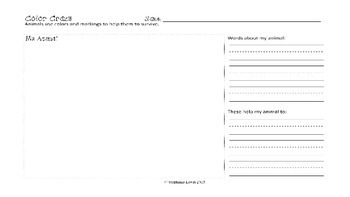 This packet includes lesson plan, a link to the original Project Wild lesson, two different ELA recording sheets to accommodate different ages and readiness, and a slideshow for class discussion.